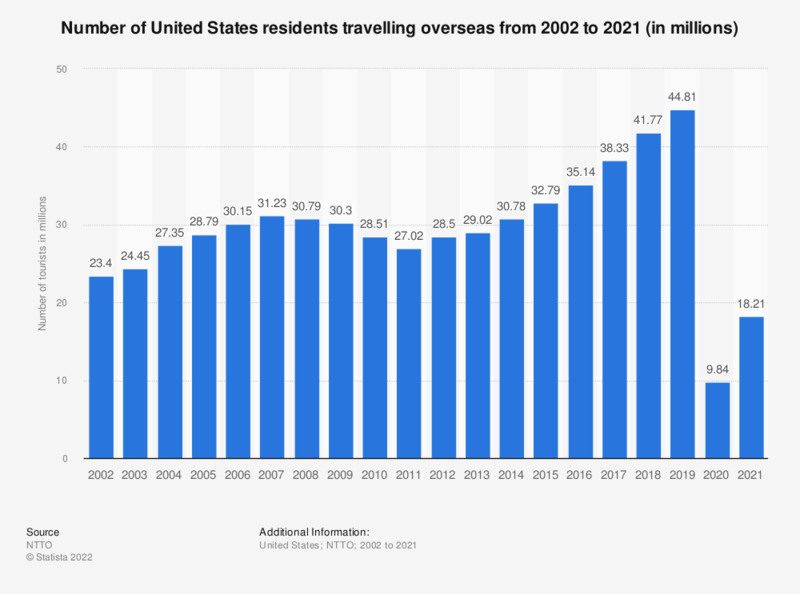 This statistic shows the number of United States residents travelling overseas from 2002 to 2017. Approximately 38.33 million U.S. citizens traveled overseas in 2017. Excluding visitors to Canada and Mexico, the number of United States residents traveling overseas peaked in 2015 at 32.79 million. However, the number of overseas visitors decreased to 31.82 million in 2016. The total number of outbound tourists from the U.S. in 2016 was 72.56 million, illustrating the large proportion of travel to Mexico and Canada – indeed, 27.8 million U.S. residents traveled to Mexico and 12.93 million traveled to Canada that year. However, the number of U.S. visitors to Canada has seen a decrease, and subsequent increase, over the years. In 2015, the U.S. received just short of 78 million international visitors. This figure was forecasted to increase to 94.1 million by 2021. As with outbound travel, well over half of inbound visitors to the U.S. came from neighboring countries Canada and Mexico, with approximately 21 million and 18 million travelers, respectively. The most popular city destination for overseas visitors to the U.S. is New York City. International and domestic travel expenditures in the U.S. reached roughly 947 billion U.S. dollars in 2015. That same year, international travel spending in the U.S. reached 157 billion U.S. dollars.